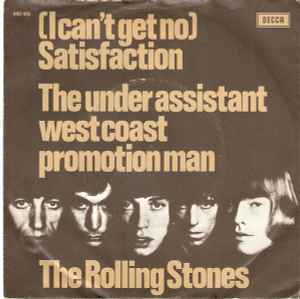 The Rolling Stones Song of the Day is- The Under Assistant West Coast Promotion Man. The writing credit goes to Nanker Phelge- aka The Rolling Stones. Mick Jagger wrote the words. The song appears on Out Of Our Heads. The tirade from Mr. Jagger came at the moment when relations between their manager Andrew Loog Oldham and Eric Easton who was also part of The Stones management reached a point of no return and the notorious Allen B. Klein was about to take over as manager. George Sherlock was a promo man for London Records who was the subject of the song. This is an early example of The Stones writing a song about their personal experience. One of my favorite songs on Out Of Our Heads. This is the last Stones song that was credited to the group as a whole as Nanker Phelge- from this point on the Jagger- Richards team would credit the songs they wrote to just that- Jagger- Richards. The song was recorded at Chess Studio in Chicago. This song is tight. Something just hit me. Mick HAS NO RHYTHM! He can sing just fine, but the way his body jerks! Hey, it proves rhythm ain’t everything 😉 I hope the comment is taken in the lighthearted manner in which it is being given. This ain’t no diss, k?